Alright, so it’s not a real fully automatic AK-47 but it’s about as close as you can (legally) get in the United States. The gun in the video is a converted WASR-10. The converted WASR-10 is capable of fully-automatic fire and can shoot for as long as you’ve got your finger on the trigger and a drum full of ammo. How long is that? Well, you’re about to find out! Our heavy fingered host, Iraqveteran8888, prepared for this test by oiling the weapons with FireClean lubricant, picking up plenty of 124 grain ammo, and filling up dozens upon dozens of ammo drums and PMAGs. 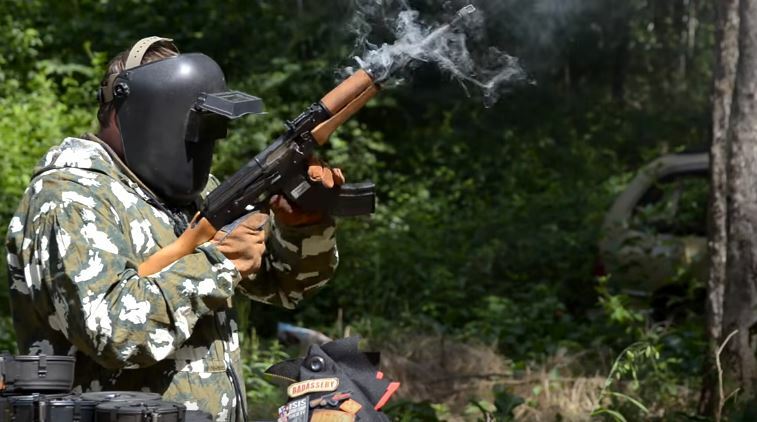 With everything in place the shooter covers himself up with a jumpsuit, welders mask, and military style helmet and starts letting the led fly. Sit back and enjoy the show!